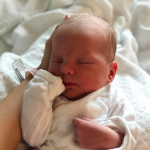 Alec Baldwin and his wife Hilaria recently welcomed a baby boy and now they’re revealing his name, as well as a sweet photo of their newest addition’s precious face. Posted on November 3, 2017 by Miranda M. by Miranda M.
Congratulations to Alec Baldwin and his wife, Hilaria…the couple have another new addition on the way, their fourth child together! Posted on September 13, 2016 by Miranda M. by Miranda M.
Congratulations to actor Alec Baldwin and his wife, Hilaria, who welcomed their third child together on Monday, September 12. It’s a boy! Table for five, please. Alec Baldwin and wife are expecting their 3rd child! Posted on March 12, 2016 by Jenny S. by Jenny S.
Three babies in three years may seem like a lot to some people, but Alec Baldwin and his wife Hilaria are up to the challenge!